The Pittsburgh Compline Choir exists for a quite specific purpose. 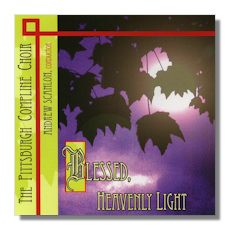 Founded in 1988 by one of the composers, John W. Becker (b.1928), represented on this CD, Blessed, Heavenly Light, it meets every Sunday in Pittsburgh, Pennsylvania, to sing choral music from six centuries. The music is broadly in the chant tradition and sung at Compline, the ninth and last service of the Canonical hours, the last time for christian worship before the end of the day. This means, of course, that the music seeks realms of rest, quiet, peace and gratitude. Blessed, Heavenly Light, indeed, contains music as old as the anonymous mediaeval chants, Conditor Alme Siderum, and Psalm 91, Qui habitat, from the Carpatho-Rusyn tradition and composers from the English Renaissance, Tallis and Mundy. And more contemporary offerings by Howells, Edward Bairstow (1874-1946) and living composers… Joyce Moon Strobel (b.1939) and Alastair Stout (b. 1975). In addition to music by Vaet, Weelkes, Wesley, Stravinsky and Britten, less well-known composers – Robert Stone (1516-1613), Harold W. Friedell (1905-1958), C Hylton Stewart (1884-1932) and Jehan Ariste Alain (1911-1940) – are also represented. None of the items presented here is so well known as to be superfluous. There are two main areas of obvious value in this most pleasing collection and one less obvious. The music is varied yet unobtrusively directed to the peace and sense of fulfillment appropriate to an evening service. The balance between items – with an organ voluntary, Evening Song by Bairstow – aids appreciation. The singing is first class: although there are some professional musicians in the 24 voice Pittsburgh Compline Choir, there are also graduate and undergraduate students, parish and lay clergy – from the wider metropolitan Pittsburgh and southwestern Pennsylvania area. What might not be obvious from listening to the CD, which is entirely "locally" produced, is how much work the Choir's dynamic conductor, Andrew Scanlon, has put into shaping the choir, effectively bringing it from an aspiring group of amateurs to a highly polished and accomplished body totally capable of some very accomplished interpretative and performance feats. The articulation, for example, is crisp and melodious. The words are clear at every turn. The singers' phrasing adds to the sense of purpose of each of the items. What's more, the balance between forward movement and reflection is just right: listen to the way Becker's setting of the Lord's Prayer [tr.16], for example, unfolds. While seeking quiet, the choir's lack of undue introspection in offering it to us conveys a sense of why we might want it. There is an immediacy which focuses the music nicely. Yet no urgency or imposition. Just what is needed not merely to suggest the atmosphere of Compline; but to draw us into a more collective and "present" experience of it. This is furthered by the variety of pieces and performance styles… Britten's A Hymn to the Virgin [tr.18], for example, is performed with space and time uppermost – not the notes as a flat score to be journeyed through. One might now wish for another CD from the Pittsburgh Compline Choir performing one or two more substantial works, so persuasive and sure is their grasp of those to be heard this time. It's a testament to what can be achieved if the right mix of technique and enthusiasm is captured in the right circumstances. The acoustic is appropriate – that of St. Winifred Church, Pittsburgh. The note that comes with the CD could profitably have been more informative; but all the salient details are here. This unpretentious, refreshing and translucent production is well worth seeking out and enjoying. This CD can be obtained from CD Baby.